HGTV is taking daily entries, beginning today, for a chance to win their completely furnished HGTV Dream Home 2017, a Honda Pilot and a QUARTER OF A MILLION DOLLARS!!! Enter daily for your chance to win HGTV Dream Home 2017, a waterfront paradise dressed with furnishings from Wayfair and located in the vacation destination of St. Simons Island, Georgia, plus a brand new Honda Pilot and $250,000 provided by national mortgage lender Quicken Loans. The grand-prize package is valued at over $1.7 million! 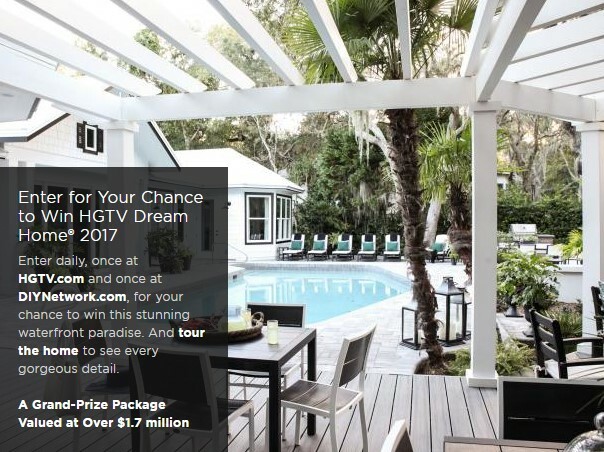 Grand Prize: One (1) Grand Prize Winner shall win the Grand Prize, which consists of: (i) the home located in Saint Simons Island, GA (the “HGTV Dream Home 2017”) that is featured in the “HGTV Dream Home 2017” special (including home furnishings, fixtures, artwork, and merchandise) (approximate retail value (“ARV”): $1,490,706; (ii) Two Hundred and Fifty Thousand Dollars ($250,000) (awarded in the form of electronic funds transfer) courtesy of Quicken Loans (the “Cash Prize”); (iii) a 2017 Honda Pilot Elite automobile (MSRP: $47,870) (the “Honda Prize”)... In lieu of taking title to the HGTV Dream Home 2017 (and the contents of the HGTV Dream Home 2017), the Grand Prize Winner will have the option of receiving $750,000 in cash in lieu of the HGTV Dream Home 2017 (the “Cash Option”). If Grand Prize Winner elects to take the Cash Option, the Grand Prize winner will still receive the Cash Prize and the Honda Prize. If the Grand Prize Winner cannot take possession of the HGTV Dream Home 2017 due to a force majeure event, failure of construction, or any other reason as determined by Sponsor in its sole discretion, Grand Prize Winner shall receive the Cash Option, Cash Prize, and the Honda Prize. Total ARV of Grand Prize is $ $1,788,576 if Grand Prize Winner takes title to the HGTV Dream Home 2017 or $1,047,870 if Grand Prize Winner selects the Cash Option in lieu. HINT: Be sure to enter TWICE a day! See the rules for details! This Sweepstakes ends on 02/17/17 and you can ENTER DAILY to win.